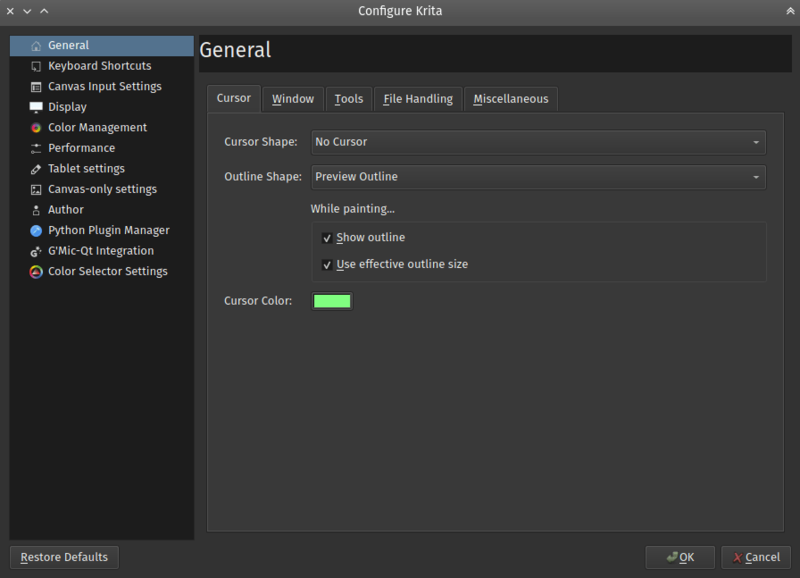 You can access the General Category of the preferences by first going to Settings ‣ Configure Krita. Select a cursor shape to use while the brush tools are used. This cursor will always be visible on the canvas. It is usually set to a type exactly where your pen nib is at. The available cursor types are shown below. Shows the currently selected tool icon, even for the freehand brush. Shows a small white dot with a black outline. Show no cursor, useful for tablet-monitors. Gives a small white triangle with a black border. Same as above but mirrored. Gives a single black pixel. Gives a single white pixel. Gives a circular outline approximating the brush size. Gives an outline based on the actual shape of the brush. Gives a circular outline with a tilt-indicator. This option when selected will show the brush outline while a stroke is being made. If unchecked the brush outline will not appear during stroke making, it will show up only after the brush stroke is finished. This option works only when Brush Outline is selected as the Cursor Shape. This makes sure that the outline size will always be the maximum possible brush diameter, and not the current one as affected by sensors such as pressure. This makes the cursor a little less noisy to use. This can be either tabbed like GIMP or Painttool Sai, or subwindows, like Photoshop. Allows you to set a picture background for subwindow mode. Set the color of the subwindow canvas area. This gives an outline when moving windows to work around ugly glitches with certain graphics-cards. Whether or not you want to see the on-canvas pop-up messages that tell you whether you are in tabbed mode, rotating the canvas, or mirroring it. Attempt to use the Hi-DPI support. It is an option because we are still experiencing bugs on windows. An instance is a single entry in your system’s task manager. Turning this option makes sure that Krita will check if there’s an instance of Krita open already when you instruct it to open new documents, and then have your documents opened in that single instance. There’s some obscure uses to allowing multiple instances, but if you can’t think of any, just keep this option on. Gives you the tool options in a docker. Gives you the tool options in the toolbar, next to the brush settings. You can open it with \. This switches the function of the Ctrl and Alt buttons when modifying selections. Useful for those used to Gimp instead of Photoshop, or Lefties without a right-Alt key on their keyboard. This allows finger painting with capacitive screens. Some devices have both capacitive touch and a stylus, and then this can interfere. In that case, just toggle this. This enables kinetic scrolling for scrollable areas. Will activate if it can recognize a touch event. May not always work. Will activate when it can recognize a click event, will always work. How quickly the feature activates, this effective determines the length of the drag. Whether to show scrollbars when doing this. This opens the regular empty window with the last used workspace. Load the last opened session. If you have Save session when Krita closes toggled, this becomes the last files you had open and the like. Show the session manager directly so you can pick a session. Save the current open windows, documents and the like into the current session when closing Krita so you can resume where you left off. Here the user can specify how often Krita should autosave the file. You can tick the checkbox to turn it off. For Windows, these files are saved in the %TEMP% directory. If you are on Linux they are stored in /home/’username’. This increases the zip compression on the saved Krita files, which makes them lighter on disk, but this takes longer to load. Upon importing Images as Layers, convert to the image color space. This makes sure that layers are the same color space as the image, necessary for saving to PSD. This is the number of undo commands Krita remembers. You can set the value to 0 for unlimited undos. This determines the amount of presets that can be used in the pop-up palette. When selected Krita will try to save a backup file in case of a crash. Hide splash screen on startup. This’ll hide the splash screen automatically once Krita is fully loaded. This allows you to use the system file dialog. By default turned off because we cannot seem to get native file dialogues 100% bugfree. This allows you to set the maximum brush size to a size of up to 10.000 pixels. Do be careful with using this, as a 10.000 pixel size can very quickly be a full gigabyte of data being manipulated, per dab. In other words, this might be slow. Recalculate animation cache in background. Krita will recalculate the cache when you’re not doing anything. Changed in version 4.1: This is now in the Performance Settings under Animation Cache.